by Bryan Mero Was I excited to see a new Predator movie? Of course! And knowing Shane Black (who helped write and was in the original Predator movie) was re-assurance that it would be better than all the Alien vs. Predator sequels and Predators. I took my son and we sat in an almost empty theater on Sunday evening. Here's the setup. There are two Predators who are chasing each other. 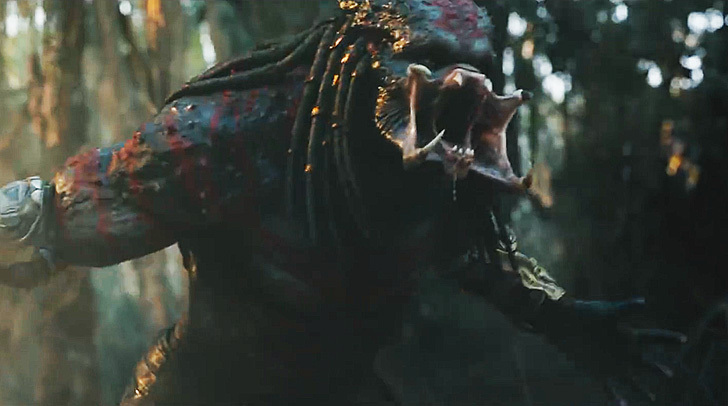 One is the classic Predator we all know and the bigger Predator you've seen in the trailers is new. In between the Predators fighting each other there are some humans. Based on this description alone, you'd either think I have no creative writting skills at all or that this is kind of a boring and not well made movie. If anyone knows me or have seen my other reviews...I have a few skills...this movie on the other hand, has none, zip, nadda, zero! This is not a well thought out or put together movie. It's as if someone thought, "I know, Predator fans just like big Predators who kill people, so that's what we'll give them!" Most movies have a 1st, 2nd and 3rd act. Predator has maybe 2 acts that all blend in together to make just a mess. This movie is messy beyond all messes. Alien vs Predator is a masterpiece compared to this movie. I heard it is was funny...more of a comedy than a sci-fi/action movie...wrong! I didn't laugh once and the only other laugh I heard was from a guy who was laughing at how stupid it was. The characters go from place to place without telling us where or how. They are just there. There's no establishing shots at all. At one point the group ends up in an RV, no explanation, they just are in it. They show up at a party as a motel...how did they find it? We don't know...they just say they are lucky they blend in. And when I say "they" I mean 'group 2'. What is 'group 2'? It's a group of military guys that are mentally unstable and being transferred. We know this because one of them introduces each of them. We aren't shown who they are, we are told. It's some of the laziest bits of writing I've seen in a long time for a movie. I want to preface this next part by saying I'm a fan of Olivia Munn. Munn plays a microbiologist that I can't even remember her name, just like the rest of 'group 2'. She gets plucked out of civilization and dropped into Predator research in the matter of 2 minutes (I'm not kidding). Her motivations are questionable. Her prescence in the film is baffling. Her performance is lackluster. There are so many things wrong with this movie that I could go on and on but I'd have to get into spoiler territory and for this, it may not be necessary. I want to see a good Predator movie but I'm not willing to sit through this garbage. I'm going to assume there is a lot more footage and they cut it back so far in order to fit more showings per day. Let's get back to what the classic Predator story should be all about...who is the Predator? The alien or man? They were able to do it right in the first movie and then the sequel. Then the entire thing fell off the rails. I'm afraid this will result in a hiatus of any more Predator and/or Alien movies (with the horrible Prometheus and Covenant movies). Let's get back to the basics. Predators like it hot and tropical. They kill for sport and they like a semi-fair fight. They are honorable when lose. They have been visiting us for hundreds, maybe thousands of years. The possibilities are endless...yet, here we are again in a small mountain town. If I ever see a Predator or an Alien in a small mountain town again, it will be too soon! Ugh...this was the worst...not only as a Predator movie, but just as a movie itself. What's wrong with you Hollywood? ?